Police have arrested two people following a warrant in Milton Keynes after recovering several stolen power tools. Following an investigation by officers, a warrant was executed in Coffee Hall, Milton Keynes on Tuesday (9/4). A number of power tools were recovered from the property that was searched. A 50-year-old man and a 48-year-old woman, both from Milton Keynes, have been arrested on suspicion of conspiracy to steal and handling stolen goods. Both have been released under investigation. 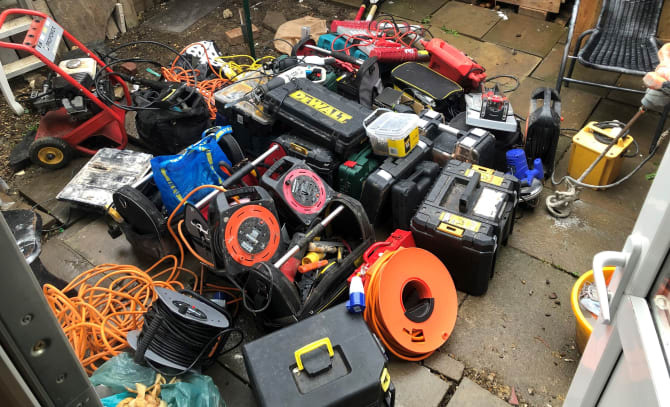 Investigating officer PC David Smith said, “I am pleased that we have been able to recover a number of power tools that are believed to have been stolen. If you believe any of the recovered tools belong to you, please get in touch at [email protected] with your name, contact details, serial numbers or distinguishing marks of your tools and your crime reference number.